Callum Booth celebrates his goal from the last time United played Alloa. However, the stunning goal ultimately counted for nothing as the Tangerines threw away the lead and ended up losing thanks to a last-gasp sucker punch. All of which means the full-back will be taking absolutely nothing for granted against the Wasps at Tannadice today. The United players may still be buzzing after beating league leaders Ross County on Tuesday night but Booth is wary of another sting in the tail from bottom-of-the-table Alloa. 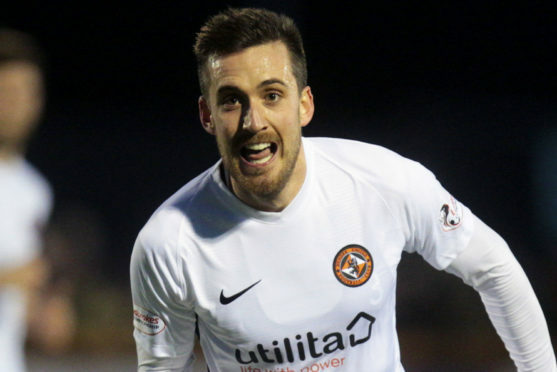 The 27-year-old, who was recalled to the team for the first time since the start of February against the Staggies, said: “Playing Alloa is in some ways harder than facing Ross County because it’s a completely different test. “Alloa are a decent side, they have caused us problems all season and I have a huge respect for what they’ve done. “They won the last game we played, which was a big blow to us, and Jim Goodwin has done a great job there. “I think this will be the sixth time we have played them this season because we’ve met in the cups as well. “We have only won once so far so that tells us we can’t take anything for granted and everyone knows how difficult it’s going to be. United were also desperately fighting to keep their title hopes alive against County. They did so successfully thanks to a solitary Calum Butcher goal with the result cutting the gap with the Staggies to eight points. United now play Alloa today and Dunfermline next Tuesday night before the Highland side return to league business and Booth admitted it is a chance his team have to seize with both hands. He added: “The mood about the place is great after Tuesday. It was a must-win game for us and they’re all like that from now on. “We play twice before County play again so it’s vital we win those to put the pressure on them. “If we can get the gap down to two points, they will have gone from having the chance to be 14 points clear to just two. “But we can’t think about that, really, because we have two very difficult games coming up. “We have given ourselves a chance, but the real test is making it count. “Obviously you would want to be closer and it’s frustrating we let them pull away a bit in the last few weeks. “So it’s easy us sitting here saying if we win the next two what will happen, the difficult bit is actually going out and doing it. “If we can do that then the title race could be back on, but the job has to be done. “Do we feel the pressure? I don’t think so because once you go onto the pitch you’re so focused on the game. “You don’t really feel too much of it. We know every game is massive now and we just have to get momentum going. Booth admitted that the United support will also have a huge part to play as the season edges to a conclusion. He said: “The fans were brilliant the other night. It wasn’t the prettiest game you will ever see but they were really behind us. “I think they can see everyone is giving 100% and hopefully they will be the same again this weekend. “The United support is the biggest in the league so they can make a difference and we can use it to our advantage. United were without key striker Pavol Safranko for the County game and he will also miss the Alloa match as he is still away on international duty with Slovakia. However, Booth believes they can cope once more without their top scorer. He added: “We lost Pavol because of international duty which was a blow because he has been great for us. “But we were still able to come out and win against County, so the lads who played were able to step up and find a goal. “Paul McMullan was brilliant. It was the best performance he’s put in this season. “We will need everyone to step up again this weekend because we know what’s at stake.